Plant tuberose bulbs in spring when frost is past. Place the Bulbs 3 to 4 inches deep and 5 to 7 inches apart. Soil Shoul be well drained and pick sunny spot for best germination, well tuberose bulbs likes hot afternoon sun. Keep the soil consistently moist before and during the period of bloom that occurs in late summer. Enrich poor soil with compost and organic amendments to increase drainage and texture for the best show of tuberose flowers. Best results of blooms come from the cultivar Mexican Single, which is highly fragrant. ‘Pearl’ offers double blooms as big as two inches across. ‘Marginata’ has variegated blooms. Plant tuberose bulbs in spring when all danger of frost is past. Place the rhizomes 2 to 4 inches deep and 6 to 8 inches apart, in well-draining soil in a sunny spot. Note: Polyanthus lily likes hot afternoon sun. Keep the soil consistently moist before and during the period of bloom that occurs in late summer. Enrich poor soil with compost and organic amendments to increase drainage and texture for the best show of tuberose flowers. Best results of blooms come from the cultivar Mexican Single, which is highly fragrant. ‘Pearl’ offers double blooms as big as two inches across. ‘Marginata’ has variegated blooms. 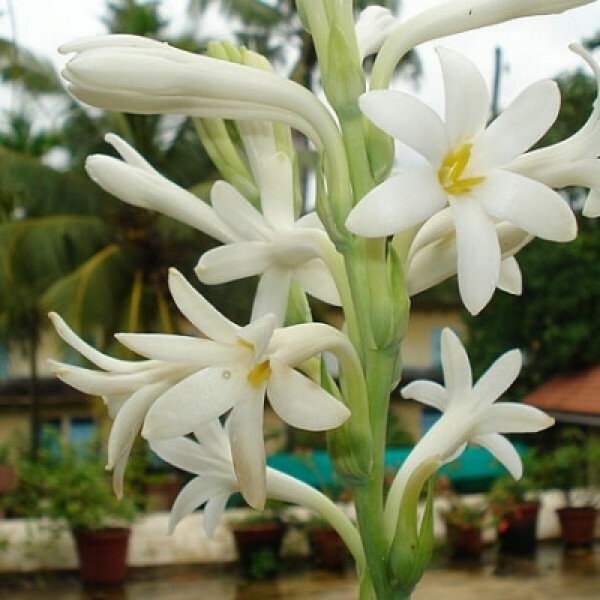 Read more at Gardening Know How: Tuberose Plant Info: Learn About The Care Of Tuberose Flowers https://www.gardeningknowhow.com/ornamental/bulbs/tuberose/tuberose-plant-info.htmPlant tuberose bulbs in spring when all danger of frost is past. Place the rhizomes 2 to 4 inches deep and 6 to 8 inches apart, in well-draining soil in a sunny spot. Note: Polyanthus lily likes hot afternoon sun. Keep the soil consistently moist before and during the period of bloom that occurs in late summer. Enrich poor soil with compost and organic amendments to increase drainage and texture for the best show of tuberose flowers. Best results of blooms come from the cultivar Mexican Single, which is highly fragrant. ‘Pearl’ offers double blooms as big as two inches across. ‘Marginata’ has variegated blooms. In this pack, 6 Fresh and healthy tuberose bulbs. Tuberose bulbs are good in size (Small, Medium). can be planted in ful sunny spot, tuberose love sunlight, afternoon sun. Soil consistently moist before period of bloom and in late summer.